I’ve said it time and time again: I will keep up with my blog this year. Well, I couldn’t even finish Think Kit this year, so there goes that goal flying out the window. I was looking forward to Think Kit for months, and then when it came around I was stumped. Whether it was a serious case of writer’s block or simply having too much on my plate at one time, I only squeezed in a couple of posts. I feel like a total failure, but I’m going to commit to getting those posts up. Better late than never! In my attempt to be an avid blogger (props to those of you who can successfully keep your blog updated on a daily basis, I am very impressed), I’ve been looking around for ideas for how to structure my blog and ideas of things to write about…and it’s proven to be tougher than what I expected. 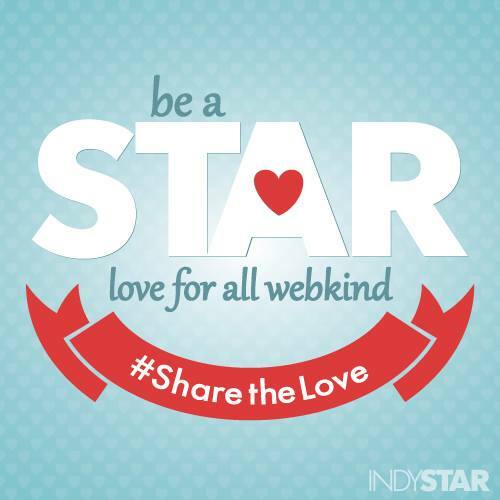 In my search for blog ideas, I came across the Indy Star’s #ShareTheLove campaign. And let me tell you: I LOVE IT. If you didn’t know, I do some freelance work for The Indianapolis Star here and there. I’m also a fairly avid reader of our local newspaper. While I don’t get the print version, I do check it out online almost daily. Something disturbing you might notice is the slew of harsh and cruel comments below each story. No matter what the story is about, you can be sure that there will be someone with something negative to say about it. You might think that these nasty remarks only happen on controversial stories dealing with politics or the such, but no, it doesn’t stop there. Once, I wrote a story about the best patios for summer outdoor drinking, a topic that is light and fun. Surely no one will have anything bad to say about drinking your favorite cocktail in the sun, right? The hatred starting pouring in from the Indy Star trolls. Apparently, I’m an idiot that doesn’t know anything about our city due to my choices on where people should enjoy an adult beverage. C’mon people, we really need to get a grip and reevaluate our lives if a story about where to drink on a patio invoke such outrage from readers. Where do these negative nancies live? What makes them so miserable that they spend their days on the internet writing mean-spirited comments on anything they can get their hands on? And why do they feel so entitled to harass people behind their computer screens? I’d be willing to bet that they wouldn’t say all of the things they do in person, straight to someone’s face. Although there are some real assholes out there, so I shouldn’t make those kind of assumptions. I’m not 100% innocent. I have done my fair share of lashing out through the internet when things make me mad. I’ve let my computer screen and keyboard grant me a sense of courage that I doubt I would have had if I had to make the argument face to face. I think that we all have said (or typed) a thing or two in the heat of the moment that we wish we could take back. And while that delete key is there, it’s usually too late. The #ShareTheLove campaign is something I think we could all take a lesson from. When the story was posted on The Star’s Facebook page yesterday, I knew the comments would come rolling in. While the majority of those were giving praise and encouraging, the haters just had to mark their territory. But what really impressed me is the way that The Star handled those comments. Taking a cue from the campaign, they replied giving compliments to the haters and nay-sayers, even offering out hugs. The person or team that runs the social media over at the newspaper handled it with grace and class, which is hard to do when you take such a beating from so much criticism all of the time. Some days you’re the dog and some days you’re the hydrant, but I feel like they are more times than not the hydrant. What would the Internet be like if everyone behaved online as they do in real life? If the bravery to be a digital jerk disappeared and we treated others as we’d treat strangers in real life? (Yes, we know there are real-life jerks, too). So we’re going to stop asking “what if” — and do something about it. And we’re asking you to join us. Please help us #ShareTheLove online during the week of Feb. 9 through Feb. 15. So what do you say, internet? How about we all make the pledge to be a little nicer? Together, we can make the digital world we live in a kinder one. Tags: #sharethelove, be kind, internet trolls, negative nancy. Bookmark the permalink.